The UK telecoms regulatory body Ofcom today published its quarterly review of the number of complaints it receives about fixed-line broadband, pay TV and monthly mobile packages. UK residents might have expected to hear that TalkTalk’s service topped the list of complaints, but that actually wasn’t the case for Q4 2013 (October – December). Instead, BT was the most complained about broadband provider as a proportion of its customer base (0.32 per 1,000 customers), followed second by EE with an above industry average of 0.29 complaints per 1,000 subscribers. TalkTalk did still generate above average complaints too, with 0.21 per 1,000 customers, down from 0.27 the previous quarter. The least complained about providers were Virgin Media, followed by Sky. Ofcom said that the main source of BT complaints were related to service faults and how those faults were subsequently dealt with. It was a similarly grim picture for BT in the pay TV stakes too – it was also the most complained about provider here during the period, with 0.31 complaints per 1,000 subscribers. Ofcom did note that the number of complaints “had notably decreased compared to the previous quarter” but then added that “they remained well above the industry average”. For pay TV, most of the complaints related to billing and service faults. 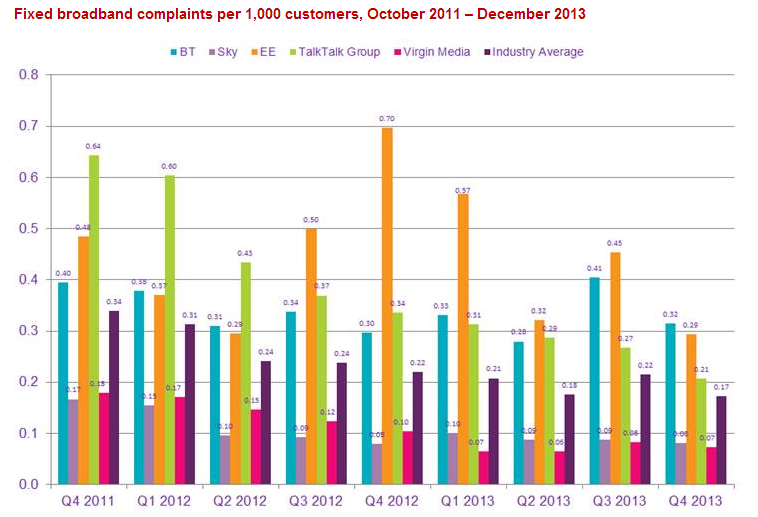 Sky TV generated the fewest complaints – just 0.02 per 1,000 customers. The report also looks at complaints from mobile pay monthly customers, and found that Orange and T-Mobile topped the list in the UK with 0.12 and 0.11 grumbles per 1,000 customers. Again, they generally seemed to be about billing and issue handling. At the other end of the scale, O2 and Three were the least complained about operators – with O2 having the lowest figure at 0.029 per 1,000, and Three achieving its lowest figure since Ofcom started tracking them at 0.033 per 1,000. The news that BT has topped both the broadband and pay TV complaints tables won’t help the the company in its battle with numerous rival providers and it’s two areas that it can’t afford to be stumbling in – rivalry is as intense as ever from a superfast broadband perspective and it’s only really just limbering up to take on Sky’s pay TV packages. From TalkTalk’s perspective, the company has obviously been focusing on the way it deals with customer complaints more efficiently, with fewer of them being escalated to Ofcom. While it still generated complaints above the industry average for broadband, it wasn’t the most complained by a long shot. It did still manage to top the table of most complained about fixed landline telephone providers though, so clearly the work isn’t completely done.